I secretly love math. I love math (or "maths", for you Brits) so much that I actually taught math to SAT students for almost two years after my college graduation. 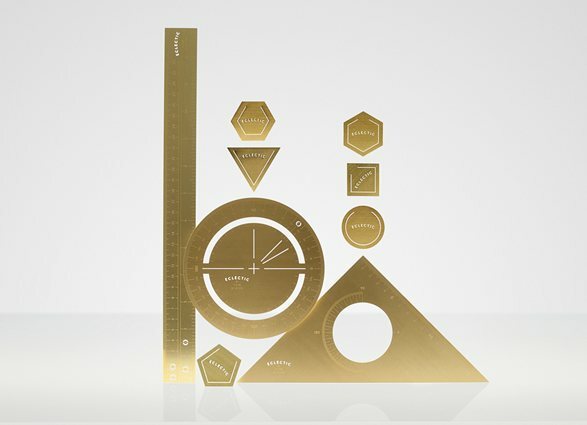 So when I saw this Tom Dixon kit made for "mathematics aficionados" I knew I had to own it, or at least blog about it. But then I realized, in all my years of doing quadratic formulas and memorizing Fibonnacci sequences, I never ever used a freaking ruler. So really this is for the "precision draughtsman", the second suggested user of this set. But, uh, I think everyone who drafts things uses computers now. So really, now, this is for people who like brass rulers and protractors and paper clips. Which is okay, because that's me, too.